I gave this cutie to our physician. She made several calls during a weekend to check on my husband. He fainted at work (from pain of falling and hyper extending his knee) and we just wanted to make sure the symptoms were just that - fainting! And he is fine but it was one of those things that shook him up enough to be more concerned about his health. has appointments for the dentist!!!! I am sorry that he had to be scared but nagging wasn't helping! This is for the Mountain Plains Crafters challenge and Unity Friends with Flair. super cute card! Sorry to hear everything your hubby is going through. Thanks for playing along with Mountain Plains Crafters! Aw, love this. Hope hubby is on the mend! Sorry about the health scares. This card is really cute. Love the pop up bench. Lovely card. Great pop up design. Fabulous, love that clothesline! I am glad to hear your husband is okay. Sorry to hear about hubby! Sounds like he's OK, though. 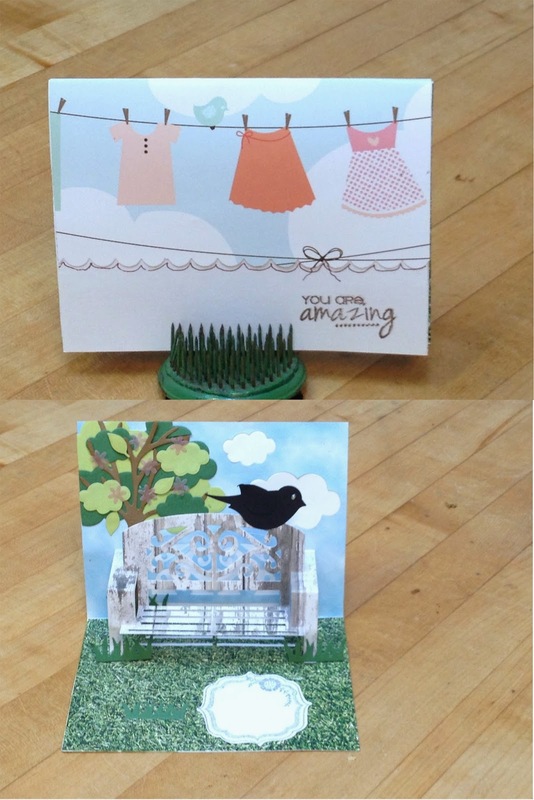 Great cards -- love that park bench! Fantastic card! Hope your DH is better soon. What a sweet scene and thoughtful card. Such a sweet card; I'm relieved that your husband is fine. They can be so stubborn some times when it comes to going to the doctor. Love the pop up card. Glad your hubby is ok.
Beautiful card! SO glad to hear your husband is fine - hopefully he'll listen to you more often not! This is lovely, Barb. That bench die is adorable! Glad to hear hubby is okay. That's a cute laundry line!